The Ride of Fame® is a continuing series of mobile monuments dedicated to celebrated personalities making large impact to their fans with specific ties to New York City, as well as such celebrities preserving a time capsule commemorating their moment in time with their fans in New York City. ROF commemorates a moment in New York City’s date and time in reference to each celebrity’s respective “I” recognition, whether he/she is an “Immortal”, “IT” or “imminent” honoree. Chosen honorees are recommended by an internal algorithm comprised of prospective honoree’s industry specific awards, social media channels presence, fans’ votes, and other related quantifiable entities. Each IT and Immortal honoree receives a customized artwork in person at a press and public attended red carpet, ribbon cutting ceremony. These customized artwork is comprised of the honorees most recognized and celebrated endeavors. The artwork is applied to the front of a double-decker bus, as well as a seat with his/her personal message scribed at the induction ceremony. Both front tribute decal and seat are permanently** applied to one bus, which serves as a lifetime pass for the honoree and his family use. Each imminent honoree receives a permanent** seat on the imminent double-decker bus. They will have the opportunity to pen their personal message on their seat. More than one imminent artist will be present on this bus. 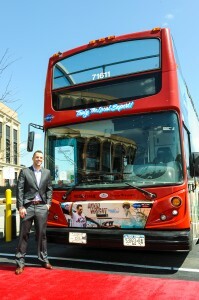 Ride of Fame® events (#ROFRide) also connect celebratory figures with fans and media, usually on a double-decker bus or a sightseeing ferry boat. What started in 2010 as part of the 100th Anniversary celebration of Gray Line is now a global sensation. Look out for cities around the world begin its own Ride of Fame® honors. So vote TODAY for your favorite celebrities to be part of the Ride of Fame®! **Participants honored by Ride of Fame® are unpaid and they themselves do not pay to participate. 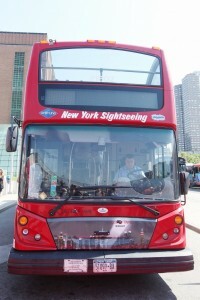 Participation with the Ride of Fame® is not an endorsement for services and products operated by Gray Line New York, CitySightseeing New York, CitySights and other affiliated entities. Such endorsement by celebrities is strictly voluntary and unsolicited. Decal graphics remain on said bus until they are removed due to the incapacity of the vehicle, request for removal by participants or representative of participants, or unforeseen changes/eventual decline or stoppage to the operation of said bus.